Prohibition reigned that New Year of 1926, and Chicago was a wide- open town. When the mobs staked out their territories, he who trespassed died - rubbed out by hired hands. 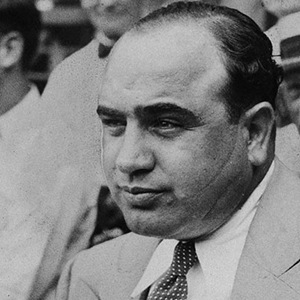 Alphonse "Al" Capone had made his share of "arrangements". Recent mass carnage had left him sole proprietor of a chain of breweries, brothels, speakeasies and gambling dens that netted millions. The press, politicians and the police were all in his pocket. He was 27. Thomas "Fats" Waller was another kind of prodigy. To him, a "mob" was what packed in to hear you at Harlem rent parties. The "family" were your musical mentors, people like James P Johnson and Willie "the Lion" Smith; an "arrangement" was something you did on the piano. His experience with booze and women was strictly from the consumption end, and his only brush with the law was dodging the prcoess server to avoid paying alimony. When Fats left New York for Chicago to play a few gigs, he was 21 years old. The ebullient young man with the dazzling jazz style was a big hit at the Sherman Hotel. His nightly audience included men with wide lapels and bulging pockets. One evening Fats felt a revolver poked into his paunchy stomach. He found himself bullied into a black limousine, heard the driver ordered to East Cicero. 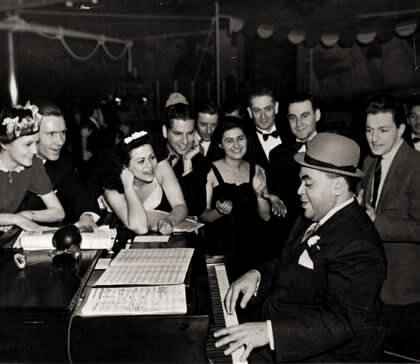 Sweat pouring down his body, Fats foresaw a premature end to his career, but on arrival at a fancy saloon, he was merely pushed toward a piano and told to play. He played. Loudest in applause was a beefy man with an unmistakable scar: Al Capone was having a birthday, and he, Fats, was a present from "the boys". 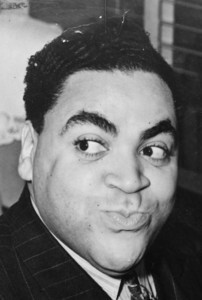 Not being from a wealthy family, one of the few material items I inherited from my late dad was his Fats Waller albums.